I am organizing an in-game Treasure Hunt for newish players. Ship requirements: You will need to be able to cargo scan and use combat probes (expanded probe launcher). A MWD is highly recommended. A fast ship with scanning bonuses is best – either a T1 exploration frigate or a Covops frigate. Travel requirements: All locations are in high sec space. Due to anchoring restrictions, it will be in 0.5 – 0.7 space. It is possible that it will be shorter to travel through lowsec between locations, but it is not required. Do so at your own risk. Rewards: Rewards will be modest. Each container will have some random exploration loot. The final container will have something useful for exploration. Registration: Send Tas Exile an in-game mail. I will only respond to characters that meet the age limit. I will send you starting instructions including a staging area, a container name, and the last 4 characters of the container password. The first 3 characters of the password will be provided via game mail at the start of the hunt. How it works: Everyone will assemble at the staging system. At 11:59 EVE time, I will log in, send a massmail to the participants with a starting system and 3 character password prefix and then I will warp to the first location. You will need to come to the correct system, scan me down and warp to my location. When you find me, there will be several containers anchored nearby. You will need to find the container that I assigned to you and open it using the correct 7 character password (first 3 characters will sent at the start of the hunt, last 4 characters will have been sent to you at registration). Depending on the level of participation, multiple players may be vying for the same containers. Inside the container you will find a bookmark to another location in space. You will need to travel to that bookmark. When you get there, you will see 4 containers about 75-100 km away. Each one will contain loot and some will contain loot and a bookmark. You will need to cargo scan the container. The password to the container is the 3 characters from provided at the start of the race and the first 4 characters of the exploration loot inside. For example, if the 3 letters provided were “TAS” and the cargo scan showed a bookmark and 3 Power Circuits, then the password would be “TASPOWE”. Again, you will need to follow the bookmark to the next location in space. Some locations will contain a puzzle container. It has no loot inside, just a bookmark. The password is 7 letters/numbers (all caps). The name of the container is the clue. For example container name is “11223344 5xxxxxxx”. Password would be “5667788”. These puzzles will be significantly harder than that example. If you arrive at a location and all the bookmarks are gone, then someone has beaten you to that location and you are effectively out of the hunt. You can still help yourself to any loot remaining in the containers. At each location you will have to decide which and how many containers to go for based on your competition. The final location will not have a container visible on grid. It will be approximately 500km from where you land. It will be aligned with one of the planets in the system. You will need to use your directional scanner to find which planet the container is aligned with and then MWD in that direction. Hopefully you chose correctly. The container will be named “TREASURE”. 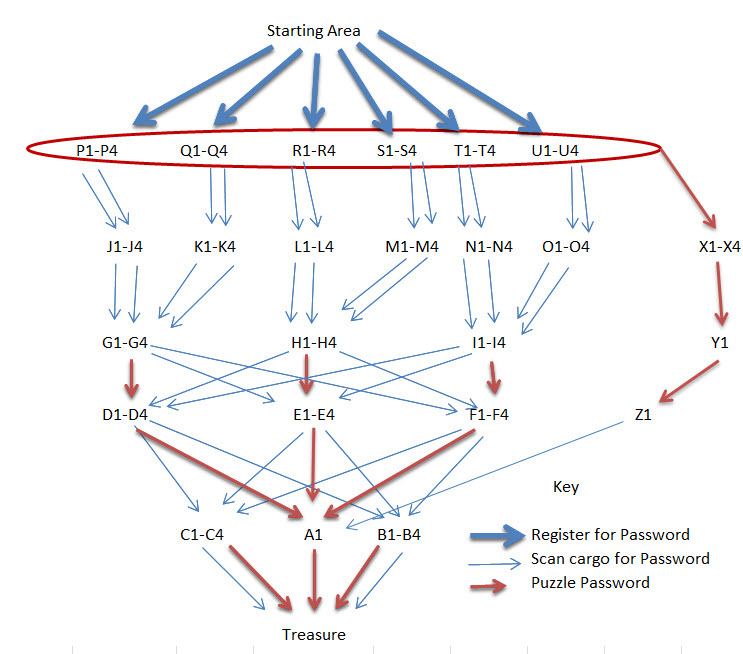 The password format is the same (3 characters provided at the start + 4 characters from the scan). The puzzle path is slightly shorter in terms of jumps, but the puzzles are pretty tough. Each stage is roughly 10-15 jumps apart so expect to do a lot of flying. To play, send an in-game mail to “Tas Exile”. Registration opens on Sunday, Aug 10, 2014. You can send mail before that if you wish, but I won’t be reading registrations until then. Registration closes Thursday Aug 14. This entry was posted in EVE, New Player and tagged New Player, treasure hunt on August 8, 2014 11:44 am by Pilgrim in Exile. As mentioned previously and elsewhere, new players that don’t connect with other players through a corporation or chat or trade or some other mechanism as likely to leave EVE. What can CCP do to help connect these players? For starters, they can help develop and support the major newbie friendly corporations already in existence. Eve University, Red vs. Blue, and Brave Newbies come to mind, but I am sure that there are others. I know this is kind of dangerous ground from a community relations standpoint, but I really think CCP should officially recognize a handful of corporations as “New Player Friendly”. There should be a set of criteria to be met and CCP should spend some time regulating the list and following up on any complaints. Once the list is in place, it should be mailed to players that complete the tutorials along with a “letter of recommendation” encouraging them to consider applying to one of those corporations. They also need to have another look at the tutorials. They are well done and necessary, but at the end, they leave a new player very directionless – especially on the all important social aspect of the game. The only pushes that the tutorial leaves you with are missions (Sisters of Eve arc) or faction warfare. Missions is pretty much the “leveling up the Raven” problem. Faction Warfare is pretty messy for a new solo player to get into. Depending on what you choose (should be given the option of accepting the suggestion, or choosing a different one), you are given a set of items (above and beyond what was received in the tutorial) that will get you started on that path. For example, a Trader might be given the option to buy ammunition below cost and then told the best place to sell it is the regional market hub. He flips his ammo making $10M isk or so and then has a small amount of capital to do some more trading – as well as a basic idea of where the hubs are. An explorer might be given a “tip” to scan in a certain out-of-the-way system and find some extra data sites. A pirate might be given a couple of “security tags” that could be sold or used as needed. Finally, based on final choice the best matching newbie friendly corporation from the list could be suggested (along with basic advice for applying to a corporation and what API keys to give out). I think the biggest hurdle for a new player looking to connect is to figure out how to do so without being taken advantage of. 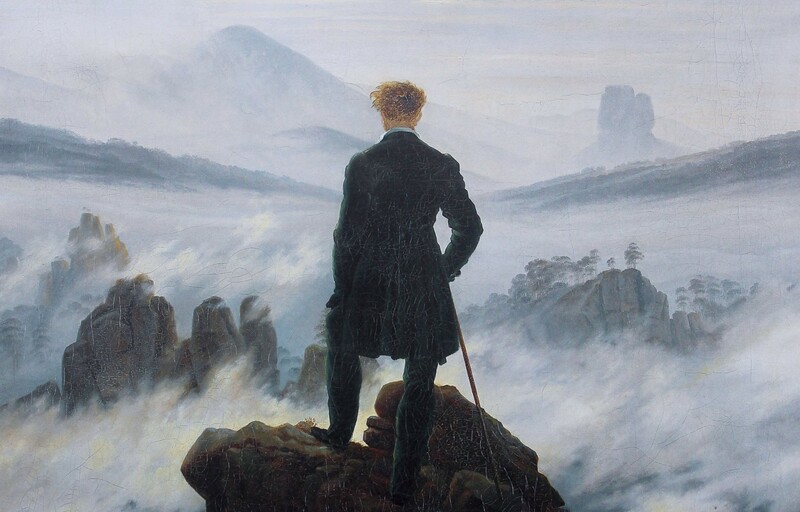 The current way of doing things is fine for a sophisticated player that is willing to spend several weeks researching EVE before playing, but the average player is just going to follow the game’s lead and then leave when they get bored. Therefore, I think the game needs to lead them down a connection path. Even if they decline or choose something else, at least they have a safe option early on. They can choose to take more risks later when the understand the game better and have met a few people that they can “trust”. (Not that you can ever fully trust someone in EVE). 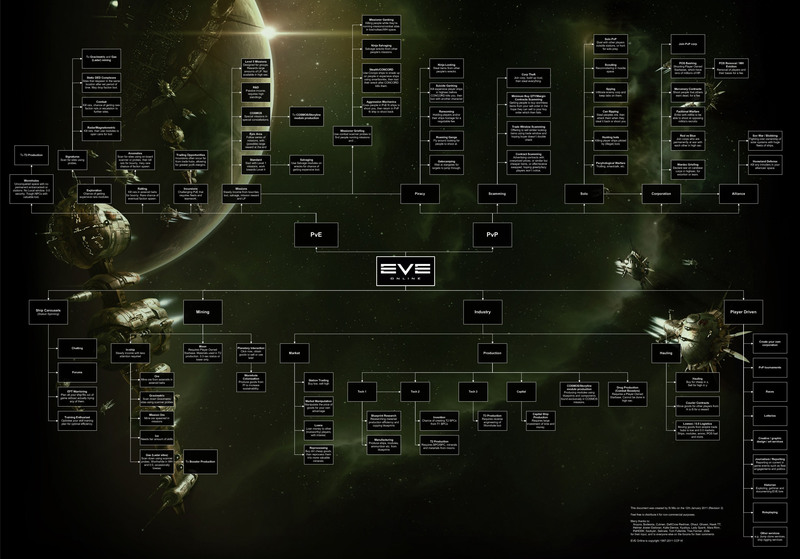 This entry was posted in EVE, New Player and tagged crazy ideas, New Player on May 14, 2014 2:48 pm by Pilgrim in Exile.